Three years ago my husband and I bought a lovely three-bedroom home on a little more than half an acre of land. If you’ve read my previous posts you know that we have put a lot of work into our land to bring fertility and beauty to an acidic, parched, sandy lot that had been neglected and abused for decades. We busted our butts clearing scrub brush and overgrown azaleas, and breaking up the compacted soil by tilling almost the entire yard. I planted fruit trees and blueberry bushes, strawberries and asparagus – plants that will produce every year with a little care. I built raised beds and created soil out of yard and kitchen waste, composted manure, and peat moss. I tossed about 100 earthworms in the beds to eat the organic matter in them and turn it into microbe-rich worm dirt, then started heirloom seeds to grow delicious, nutrient-rich food. We went further in our dream of a sustainable life by getting baby chicks and raising them up. We built them a chicken tractor and moved them to a new patch of grass every day or so. We were happily surprised about how much better the yard looked a couple of weeks after the chickipoos had scratched and aerated the soil, eaten all the plants & bugs, and left a bit of fertilizer behind them. And at the end of the day, we had fresh, delicious eggs! We also built a worm bin. Whatever kitchen waste the chickens wouldn’t eat (coffee grounds, tea leaves, etc) went to the worms. That worked well for a while, but our worms decided to migrate and left the bin one day. It was kinda weird, but other folks I’ve talked to say that worms do that sometimes. Along the way I discovered fermentation and took to it like a duck to water. I’ve made all kinds of fermented veggies, brined eggs, soft and hard cheeses, bacon, prosciutto, kombucha, kefir, yoghurt, skyr, clabbered milk, mead, hard cider, beer, and wine. Lots of fermentation going on! When we bought our home we thought we’d be there for a very long time, but life happens. Neither of us were successful in finding employment that we were in the least bit happy doing. I spent many months trying to get our business off the ground, but after failing to get financing we came to the conclusion that we were simply in the wrong place. We had chosen our town because of the lovely little downtown area, but you know what they say about books and covers. There was really very little going on in the CSRA that we could do for recreation other than tending our animals and our plot of land. Those things were great, but we had left an amazingly rich life back in the Ozarks before moving to South Carolina. Last summer my dear friend, Hope, and I had taken a trip to see Rock City. Both of us are fans of Neil Gaiman’s American Gods and had always talked about going together to see where the battle scene in the book took place. I fell in love with Chattanooga! It reminded me of my old hometown of Fayetteville, AR, but it’s even funkier. I knew my hubby would like it because of the mountains and the wonderful local food culture. So when the opportunity presented itself, I encouraged him to apply for a job there and since he’s super awesome, he got it! Now we’re living between two places: our house in Aiken and our rented apartment in Chattanooga. We realized a few months ago that we have a big house that costs a small fortune to heat and cool, but we only live in three rooms. The whole time we’ve lived there we’ve had one guest that took advantage of our guestroom… one! We have decided that if we want to seriously commit to a sustainable lifestyle and stop spending all our time dealing with household maintenance, we have to make a big change. In a few weeks we’ll have an estate sale where we will be selling off at least 70% of our belongings. It hurts a bit, but it’s just stuff. Then we are going to sell our house. I’m really hoping that someone comes along that wants to garden and falls in love with our property. The hard work has been done already, they just need to plant and tend the garden. Once the house is sold, we are buying at least five acres of property outside of town and we’re going to build a tiny house! By selling most of our stuff we’re hoping to whittle things down to a much more manageable state. We won’t have room for a dishwasher, so we decided to cut down the number of dishes we have. Instead of a set of eight dishes, we currently have a set of four. We are thinking about cutting that down to a set of two. That way, I will wash each of my dishes when I’m done with it and not have a big pile of dishes to wash everyday. And if we do have company, they will be told ahead of time about our kitchen arraignment and to bring their own dishes. With less of our time being spent on things that aren’t really important, we can devote ourselves to the things we really love to do: hiking, dancing, brewing, gardening, raising critters, reading, and hanging out with friends. And hopefully, we will start our business in Chattanooga. The culture here is much better for what we want to do. I’m sad to think about what we are leaving behind. But I’m even more excited about what lies ahead! In March I gave a class on Basic Dairy Fermentation where we covered clabbered milk, kefir, yogurt, and skyr. I made kefir pie (a play on a traditional buttermilk pie) that I shared with my students to show them the range of things you can do with fermented dairy. I’ve been asked for the recipe so here it is! Preheat oven to 350 degrees (175 degrees C). Beat eggs until frothy; add butter, sugar and flour. Beat until smooth. Stir in kefir, vanilla, preserved lemon, and nutmeg; pour into pie shell. Bake for 40 to 60 minutes, or until center is firm. Eight years ago I was cloistered away in my little apartment working on my master’s thesis in Late Antiquity and Early Medieval History. I spent months obsessively documenting silk trade, technology, and fashion as it moved both west and east throughout the Eurasian continent. Now you may be asking yourself what in the world does ancient silk trade and fashion have to do with the world’s oldest cheese? I beg your patience, dear reader. I will get to the cheese, but first let me tell you about one of the peoples I researched and wrote about in my sleep-deprived, madness-inducing, thesis writing experience. Some of what follows will be directly from my thesis, The Emperor’s New Clothes: Sericulture, Silk Trade, and Sartorial Exchange Along the Silk Road Prior to the First Crusade (Fayetteville, AR: University of Arkansas, 2006), while some is new research. Since I have no personal pictures of the mummies, I will link to websites that do have pictures (let them worry about copyright infringement!). Unfortunately, I seem to find the best pictures on some of what I as a scholar deem to be less than reputable sites. I know that the pictures and maps are accurate because of all the actual reputable sources I’ve seen the same pictures in over the years, but I suppose that many academics use their photos to publish in peer-reviewed journals and books rather than websites. In the Xinjiang Uyghur Autonomous Region of China, the westernmost part of the country, many well preserved mummies were unearthed between the late 1930’s and 2009. 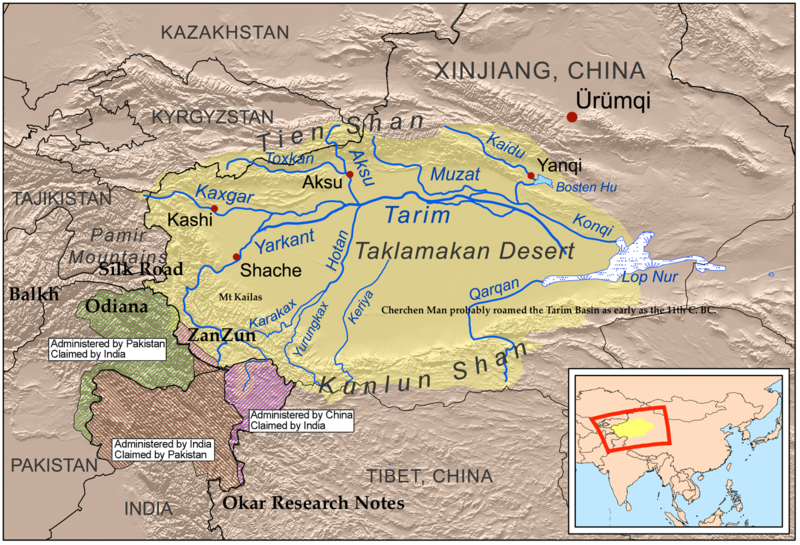 The mummies had been buried near various settlements around the edge of the Taklamakan Desert of the Tarim Basin over a thousand year period between 2000 BCE and 400 BCE. Some burial locations seem to have been chosen because the soil was infertile. This infertility was caused by geological formations of salt beds. Once buried, these bodies dried out in the desert heat and were freeze-dried during the winter. The salt beds also acted to preserve the bodies in them so well that thousands of years later their face paint is still visible and their clothing remains vibrant and whole. One of the most surprising things about these mummies, who had lived and died in the very heart of Central Asia, is that the oldest ones were Caucasian. It has not been definitively established why these people were so far east, though it is likely that they had followed their herds grazing their way along the steppe. The textiles found on and around the mummies were analyzed by Dr. Elizabeth Wayland Barber, an expert in ancient textiles and a professor of linguistics and archeology at Occidental College in California, and Dr. Irene Good, a specialist in the laboratory analysis of ancient fibers and textiles from the University of Pennsylvania. During their research, many similarities were found between the textiles buried with the Tarim mummies and those uncovered in the Celtic Hallstatt civilization, a culture that prospered in what are now southern Germany, western Hungary, and Austria, between 900 BCE and 500 BCE. The Hallstatt civilization is named for the area in Austria where the first discoveries of this culture were found buried in salt mines (not unlike the salt beds in which the Tarim mummies were interred). These far-flung burial finds may seem unrelated, however they actually demonstrate an ancient trade network had formed, or had begun to form, several centuries before the Silk Road was officially established during the Han Dynasty (205 BCE to 220 CE). The Small River Cemetery, or Xiaohe Mudi, was originally excavated in 1934 by the Swedish archaeologist Folke Bergman, but its location was forgotten for nearly 70 years. In 2000, the cemetery was rediscovered and archeologists and looters raced to uncover its secrets. Between 2003 – 2005, a group of Chinese archaeologists completed the excavation of the entire necropolis at Xiaohe. The bodies were buried in coffins shaped like overturned boats. The body was placed on the ground and the two sides of the coffin were fitted around the corpse. Next, planks that were made to fit the boat-shaped coffin were laid across the top. Then a few oxen were slaughtered, perhaps as part of a sacrificial funeral rite, and skinned at the cemetery. The coffin was then covered with the ox hides which shrunk to fit the coffin in the desert heat, like shrink wrap. Because of this, the coffins and the bodies inside were pristine. Not even a grain of sand managed to get into the sealed coffins until they were opened, either by the archaeologists or looters. The Xiaohe people were buried dressed in lovely wool clothing, leather boots, with ephedra twigs, tamarisk branches, jade beads (the nearest contemporary jade production was 300 miles away! ), feathers, well-crafted baskets, wheat and barley grains, and cow and sheep/goat ears. In addition, on some of the mummies they discovered an organic compound placed in lumps around the mummies’ necks. A few also had an organic substance in baskets near their waists. Okay, so what about the cheese? No one knows for sure when cheese was first made. There have been sieve-like vessels discovered in Eastern Europe that have been tested and found to contain traces of milk proteins. Some of these specimens are 7,000 years old! Despite this, no examples of intact ancient cheese have been found until the lumps of organic compounds on the Xiaohe mummies. To figure out how cheese got that far east we have to go back pretty far in our pre-history, to where dairy production began. On what we now know as the Eurasian or Russian steppes north of the Black and Caspian Seas, there was a group of people who spoke a common language that we call Proto-Indo-European. Now we have no written records from this era in this region, writing hadn’t been invented yet, so we have to look at the archaeological record and at the common language that modern scholars have been able to piece together. Indo-European is the language family that includes English, German, Italian, Spanish, Turkish, Swedish, Hindi, Persian, Celtic, and Tocharian, to name a few. The ancestors to all the speakers of the Indo-European languages today, the Proto-Indo-European speaking peoples, began as foragers in the river valleys north of the Black and Caspian Seas around 5200 -5000 BCE. Apart from the river valleys most of the steppes were not a good place for farming, so they relied on the foods they could hunt and gather, like wild plants and nuts, wild boar, fish, wild horses and sheep, and the wild aurochs (the largest bovine to walk the earth). The grasslands of the Russian steppe are much like our American plains, but these early ancestors did not have the agricultural advancements that the American settlers had (and a great many of those American settlers still died of starvation). There are no plants that grow there that are edible for humans, but there are 3,000 miles of open grasslands. What they could grow on the grasslands were animals: cattle, sheep, goats, and horses. Cattle, goat, and sheep domestication was revolutionary! People went from a communal, hunter-gatherer society where social status would have been dictated according to who the best hunter was or who could always find the best berries to one where social status depended on how many cattle or sheep one owned. These animals not only produced meat, but hides and wool for clothing and tents, and milk. The next important animal to have been domesticated was the horse. Horses were originally kept as food, but eventually people learned that they could ride them. Soon after the horse was domesticated the wheeled cart was invented around 3300 – 3100 BCE. This allowed the Proto-Indo-Europeans to move not only their herds when they had exhausted their food supply, but whole tribes – they became nomads. At this point in human evolution no one was able to tolerate lactose (milk sugar). The first cheese was probably a happy accident: something acidic curdled the milk (possibly stored in a bag made from an animal stomach), the lactose-heavy whey drained away and left lovely curds. The discovery of milk fermentation was just as revolutionary as the domestication of animals. Now the Indo-Europeans had access to a steady and prolific supply of protein that did not require the death of an animal. This nutritional increase resulted in these ancient people becoming physically larger than their contemporaries without access to dairy protein. This would have led to increased population growth. And as populations grow, eventually parts of those populations break off and find new herding lands – thus we have the beginnings of the Indo-European diaspora. It was one of these nomadic Indo-European peoples, the Tocharians, who traveled east with their herds. The scholars who study languages, etymologists and philologists, were able to determine approximately when certain languages, and the peoples who spoke them, left the original Indo-European group due to how much the languages changed over time. According to David Anthony’s The Horse, The Wheel and Language: How Bronze-Age Riders from the Eurasian Steppes Shaped the Modern World, it is quite likely that the Tocharians were the second group to leave the Proto-Indo-European homeland (the first to leave home were the Hittites). The descendants of these early explorers left written records in their abandoned settlements in the Tarim Basin. When analyzed the languages, Tocharian A and B, were closely linked to the Celtic language. So let’s look again at the organic compounds found on the Xiaohe mummies. The lumps were approximately 1 – 2 cm in diameter with a chunky texture. The scientists took 5 – 15 mg samples from 12 organic lumps found in ten different graves. They took each sample, ground it down to powder, added a bunch of chemicals I’ve never heard of to them and eventually got them to where they could analyze them. The proteomic (protein) analysis, Fourier Transform Infrared Spectrometry (FTIR) characterization, ion chromatography, and elemental composition analyses led them to believe that what they were looking at cheese made mostly from cows’ milk, though there were some goat or sheep milk mixed in some samples. Due to the differences in exactly which caseins and proteins remained in the ancient samples, the scientists realized that the cheese was not made with rennet nor by acidification. Therefore, they looked at milk fermentation and found that the Xiaohe samples contained proteins from lactic acid bacteria (LAB) which included Lactobacillus kefiranofaciens and various Saccharomycetaceae yeasts which are commonly found in kefir. Commercial raw milk and kefir grains (Caucasian and Tibetan) were obtained and the scientists made kefir cheese by pouring pasteurized, non-homogenated cow milk over the kefir grains and letting them sit at room temperature for 72 hours. Then the whey was strained off the curds resulting in yummy cheese. The milk, kefir grains, and kefir cheese were each dried in a vacuum centrifuge and processed the same way the organic compounds from the graves were. When the compositions of the modern samples and the ancient samples were compared it was determined that L. kefiranofaciens was the predominant source of LAB proteins in ten of the twelve Xiaohe samples. The yeast proteins were from Candida kefir (aka Kluyveromyces marxianus) and Saccharomyces cerevisiae. These yeasts are the ones found in modern Tibetan kefir. The scientists concluded that ten of the twelve ancient samples were kefir cheese. Due to the low salt content of the Xiaohe kefir cheeses, the scientists also speculated that the cheeses were made to be eaten relatively quickly, rather than being stored long term or traded across long distances. The low levels of lipids seem to indicate that the raw milk may have been skimmed. Although there was no evidence of butter production (butter is made from cream) at Xiaohe, that does not mean anything. The cemetery is many miles away from the nearest known contemporary human settlements. Due to the linguistic, textile, and DNA evidence of the early Tarim Basin mummies, we know that these ancient Tocharians were the easternmost branch of the Indo-European family tree, long-lost cousins to the Celts. They participated in dairy herding and long-distance trade. They had sophisticated textile and basket weaving techniques. And they had a rich funerary practice. The food they preferred, perhaps the food that enabled them to live in one of the most inhospitable climates that humans have ever continuously survived in, that let them cross thousands of miles of grasslands, and that accompanied the dead on their final journey was simple, delicious kefir cheese. We still don’t know exactly where kefir grains originated but since the ancient Tocharians had the kind that we know as Tibetan kefir grains, we can only speculate that they perhaps traded for them somewhere in their wanderings. Since they were trading with peoples in every direction (for evidence of that you probably need to read all the sources in the bibliography below), it may have been the Tocharians or some of their Indo-European cousins on the steppes that brought the knowledge of kefir to the west. Perhaps in time the desert will reveal more of its secrets. Anthony, David W. The Horse, The Wheel, and Language: How Bronze-Age Riders from the Eurasian Steppes Shaped the Modern World. Princeton and Oxford: Princeton University Press, 2007. Barber, Elizabeth Wayland. The Mummies of Ürümchi. New York: W.W. Norton & Company, 1999. Reprinted, London: Pan Books, 2000. Hansen, Stephanie D., The Emperor’s New Clothes: Sericulture, Silk Trade, and Sartorial Exchange Along the Silk Road Prior to the First Crusade. Fayetteville, AR: University of Arkansas, 2006. 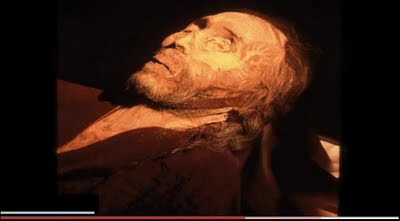 Mair, Victor H. “Mummies of the Tarim Basin.” Archaeology, 48:2 (Mar/Apr 1995), 28 – 35. Mair, Victor. “The Rediscovery and Complete Excavation of Ördek’s Necropolis.” The Journal of Indo-European Studies. Vol 34, No 3 & 4 (Fall/Winter 2006), 273 – 318. Shavit, Elinoar. “Medicinal Mushrooms: Renewed Interest in Kefir, the Ancient Elixir of Longevity.” Fungi Vol 1:2 (Summer 2008), 14 – 18. Stroud, Kevin. The History of English Podcast. http://historyofenglishpodcast.com, 2014. Thomson, Helen and Adam Cole. “Archaeologists Find Ancient Evidence Of Cheese-Making” on National Public Radio. December 13, 2012. http://www.npr.org/blogs/thesalt/2012/12/13/167034734/archaeologists-find-ancient-evidence-of-cheese-making, 2014. Yang, Yimin, et al. 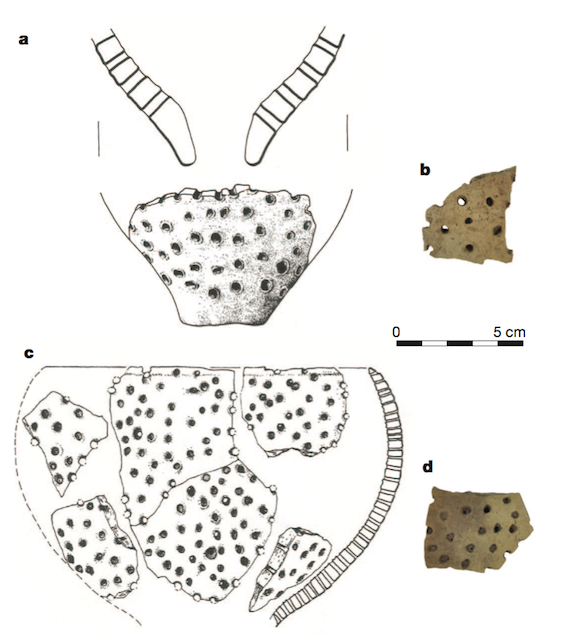 “Proteomics evidence for kefir dairy in Early Bronze Age China.” Journal of Archaeological Science 45 (2014), 178 – 186.